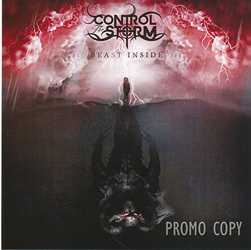 Feisty, fearsome and fulsomely British, Control The Storm are a Bristol-based female-fronted outfit who came together in 2010 from the ashes of Neverwinter. Guitarists Rich Shillitoe and Daryl Barrett-Cross, keyboard player Raedon Mac and drummer Gareth Arlett set the Storm rolling, the search for a vocalist originally yielded Hayley Martin, and Becky Baldwin filled the vacant bass slot admirably. Over the years the pack’s been shuffled and it’s with new vocalist Kate Norris, guitarist Patch Sanders and drummer Nath Hutchins alongside Shillitoe, Mac and Baldwin that Control The Storm proudly unveil their debut album ‘Beast Inside’. One of the first things you’ll notice about ‘Beast Inside’ is that it neither sounds like a band’s first outing, nor does it sound like an independent release. The band have obviously taken their time developing the songs and their arrangements, and the result is a comprehensive body of extremely classy material. The sound is full and punchy, the songs accessible yet often hiding a sting in their tail, and the overall result is quite stunning, with songs like ‘Twisted Truth’ and ‘Stronger’ in particular possessing a real depth and maturity. In terms of a point of reference the Anette Olson days of Nightwish would be a good place to start, but that’s really just based on the upbeat pace of most of the compositions and Norris’s vocals which range from the exquisite to the attention-commanding. Blend in the atmosphere of latter-day Sirenia and you’re not far off the territory Control the Storm occupy: but that’s not to say that these guys are anyone’s clones. Overall, the sound actually slants more towards the melodic metal spectrum – just check out opener ‘Day Of Days’ – imbued with key elements of the metal female voices genre (in particular Mac’s cookie-monster vocals) rather than the other way round, and the topping on a particularly tasty cake is the exhilarating lead guitar work from Shillitoe and Sanders. Control The Storm are touring fairly widely in 2015 so watch out for them.